Chapter 5, Page 2 is up. 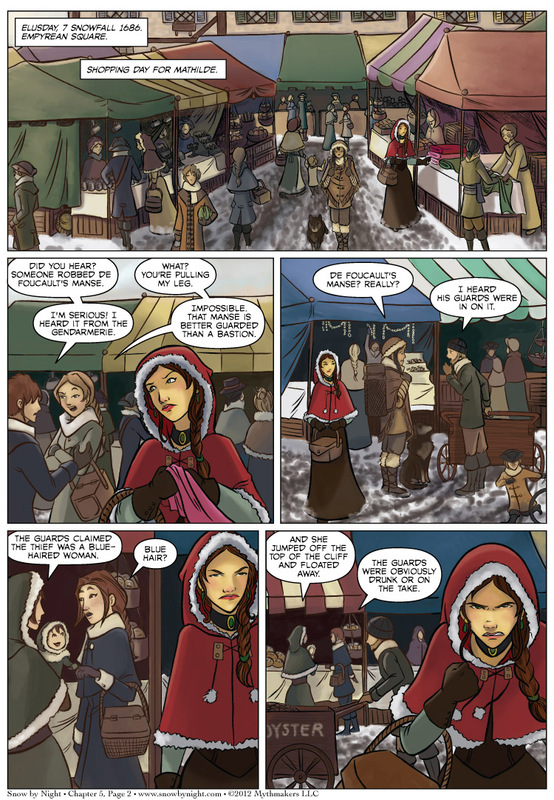 Mathilde goes shopping and doesn’t like what she overhears at the marketplace. To see a preview of what Mathilde does next, vote for Snow by Night on Top Web Comics. I’m afraid that I don’t have a convention report for you from GenCon. I have knee surgery tomorrow so I’m a little distracted. I’ll do my best to get the report up for the Friday update. Good luck with the surgery, Eric; hopefully, it leaves you in shape for table dancing! Thanks, Greg! We got back from the hospital a few hours ago. The surgery went smoothly and Eric is recovering well. Will we do Captain Featherswods Nicky, Nacky Nocky Noo? Dance with me! Dance with me, do! Jassart is such a jerk with girls, not only the non-human Snow. It seems he simply doesn´t realize how lucky he is having such a woman as Mathilde as lover, or the dangers and stupidity of wronging her. You are absolutely right on all accounts. You’re going to get to see Mathilde in action for the first scene of this chapter.